Giving your art a name/title is to me a creative and fun game where I exercise both imagination and humour. Often I end up with what is in the serendipity of my thoughts at the moment when I?m typing the title. I seldom give it much thought so I?m not the best person to give advice on how to do it. So this post is not really a how-to even though it is? How to name your art then? The best way to find out what you like, as so many times in life, is to go about and practice! To me it?s a bit like writing poetry; I just play with words. And what could be more fun, right? Mostly it is something that jumps into my mind. It could be a phrase, a word game, a song title (or a line from a song playing on the radio! ), a quote? anything! Often of course it has something to do with the art itself. What I?m talking about more specifically today is my Daily Art Cards. 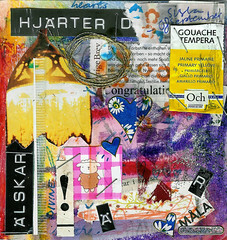 Many of the Art Cards are collages and many of the collages have words and text all over. These have sometimes been named with one or several of those words, but not always. Most of the titles are in English, but not all of them. I?ve done one Daily Art Card for each day this year and all of them have titles! That?s a lot of titles if you consider how long this year has been going on now. And actually I?m dead tired (yes I admit it) of naming right now. I still love making the cards, but my name supplier (left side of the brain?) is dry. I have several cards without name right now, and that feels sad! 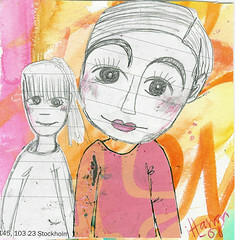 It?s kind of unfair to the poor collages and drawings that has not been properly welcomed into the world yet, because naming (at least when it comes to children) was always a way of saying ?welcome to the [art] community wee one!? Would you like to help? Please feel free to submit your suggestions below, for one or all of the cards. I?ll be cruel and pick the one I like the best for each card in an upcoming post. Titles on these cards can be a sentence, a word or what ever you think of first when you see it. Be playful, be wicked, LOL at yourself; be you! Guess this almost every card this month… please help! Just remember to place a number before your title so I know which one you?re naming, for example ?1) Name of the Card, 2) Another Daily Card, 3) Third Name of Card 3, and so on?. If your title is not picked don?t be sad, see it as an exercise for naming your own art in the future. Have fun! And a big thank you if you take the time to help me! This entry was posted in A Creative Life, Art Experiments, Collage, Creative habits, On writing. Bookmark the permalink. Thanks for the fun naming game this morning ! I love naming things too, especially people ! I have nicknames for everyone (sometimes the people know about them and sometimes they don’t ;-) ) I have to say though, I do not always name my art… I don’t know what that means…? It must be a challenge to name a piece every day! I tend to be “punny” or like play on word titles so it’s so okay if you don’t like the titles I chose for some of your pieces. I had fun doing it anyway ! Thanks again and cheers ! Haha, tack Maria! Var Bert-?ke Warg ugglan, i… Hedwig? Hmm… den ?r en ?ber-kluring! Hanna, I started naming in the card’s comments themselves before I read the rest of your post- sorry. Would this be a better way so you don’t have to go through everyone’s post for each card? Let me know and I’ll re-do them. Jepp, i Fr?n a till ? var han ugglan! I have to say, there are some amazing paintings in this blogentry! Oh Hanna this can be sometimes very dificult to name a piece of art. Sometimes I do not get further then the colors I used. Not very unique. I’ll give it a go. thanks for helping out, love the romantic suggestions! I too give my art color names, but because I use pink a lot… hehe, it becomes a bit boring after a while! :-) Take care! I’m still loving the book you sent! 04. 081017 Wow – it’s NOW! Om Du gillar dem, kommer jag tillbaka imorgon eller s? och tar mig en dust med de ?vriga ;-)! Hope I named them all. That was fun! God Bless You and Yours and Your Creative Life!!! 1,2,3,4. Hope you can figure it out or I can redo later. These art cards look like lots of fun. Hope you find the perfect names for all of them. Missed reading your blog while I was on holiday!!! the Daughter of the Madonna and a passing owl. 7. owlord won’t you buy me..
22. and the sky is blue.. The titles usually come to me as I am creating. They evolve too as the paintings do; I rarely end up with what I planned on starting with. I have dried up for names too…boo hoo…lol but I do think 081028 should be “orange is life”. I love that picture with the little orange flowers. and that is me finished. I have had a look at the others and they are much better than mine. Hope you find nice titles Hanna. 1) She turned white as a sheet in the midst of her an atmosphere filled with colors. Why does this happy post of yours make me teary-eyed? It’s so open! I think I’m a little emotional from the election here, and it’s spilling over. Life is good. I mean: 1) She turned white as a sheet in the midst of an atmosphere filled with colors. Also important: what did you name your NaNoWriMo novel this year? I haven’t named mine yet, and the poor thing feels very sad. Back to work, but it was fun to take a break and look at your art! Perhaps in honor of my Swedish heritage, I will name my novel “Uff da!” or “Lutefisk”. Julekaga! No, “Lutefisk”. I love lutefisk. Very cool. yep, that’s how i name art too, i listen for what pops into my head and go with it! Vilka UUNderbara kort! Sj?lv namnger jag mina m?lningar INNAN jag m?lar dom. Antingen en hel mening som jag sett i en tidning tex. “Hon vattnade alla blommorna b?de p? baksidan och framsidan av huset.” Och sen m?lar jag utifr?n det, eller s? om det ?r ett portr?tt eller liknande s? har jag ett namn, ?ven ett p?hittat, i tanken. tex. “Nu ska jag m?la Milea och hennes undulat”.